19 August 2016, Brussels, Belgium ~ Quick results – more details to come. It was a French punch, 1-2-3, led by Vincent Gaudriot riding the 9-year-old stallion, Tahar Du Barthas in the HH Sheikh Mansoor Bin Zayed Al Nahyan Global Arabian Horse Flat Racing Festival-supported Brussels Equestrian Endurance Masters (BEEM) 160-km ride on Thursday, 18 August, at the Sonian forest region near the city of Brussels. Gaudriot riding in fourth position in the fourth of the five-stage 160-km ride finished first with a time of 9 hours 8 minutes and 26 seconds recording an average time of 17.50kph. Julien Goachet on Ulyssa De Coat Fritty, riding third on the fourth loop, came in second at the finish, and Virginie Atger on Quersane Des Pins, running second going into the final loop, was pushed to third place. The 160km started 46 horses. 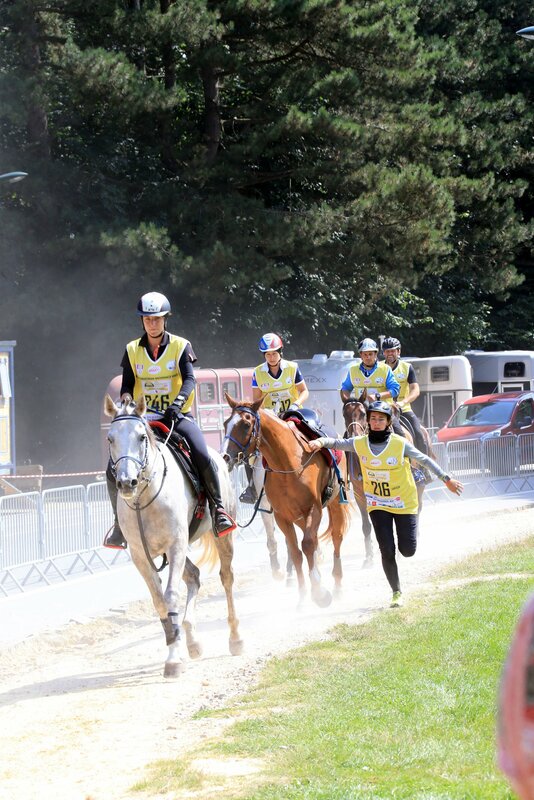 The three days of endurance races take place in the middle of a 5,000-hectare forest on trails designed for horse riding outside of Belgium. Twenty-one nations have entered the competition for the three days of 18,19, 20 August. 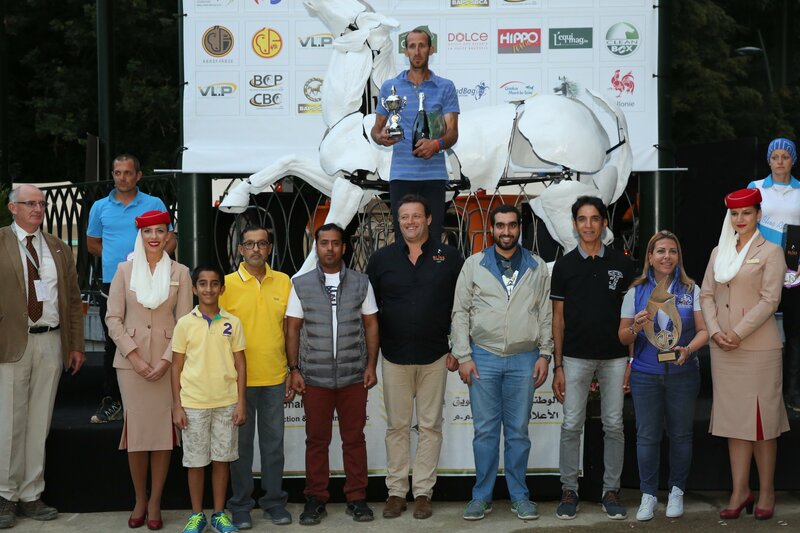 The 160-km ride was the first of the three-day Brussels Equestrian Endurance Masters (BEEM), the result of a three-year pact between the Royal Belgian Federation of Equestrian Sports (FRBSE-KBRSF) and the HH Sheikh Mansoor Bin Zayed Al Nahyan Global Arabian Horse Flat Racing Festival. In 2017 the Festival will support the HH Sheikha Fatima Bint Mubarak Ladies Endurance ride and the World Championship for Young Horses (7 years) at this venue. HH Sheikh Hamad Bin Majid Al Qasimi, Second Secretary of the Embassy of the United Arab Emirates in the Kingdom of Belgium, Saif Awani of Al Awani General Enterprises, Mussalam Al Amri of Al Jazeera Stables and Ms Lara Sawaya, Executive Director of HH Sheikh Mansoor Bin Zayed Al Nahyan Global Arabian Horse Flat Racing Festival, Chairperson of the International Federation of Horse Racing Academies (IFHRA), Chairperson of Ladies & Apprentice Racing Committees in the International Federation of Arabian Horse Racing Authorities (IFAHR) and Pierre Arnould of FRBSE-KBRSF gave away the awards to the winners of the ride. The 100 km CEI * is ongoing today 19 August.